17-19 East 11th St. stands adjacent to 13-15 East 11th St., and these two building constituted the Van Rensselaer Hotel for roughly sixty years (1912 to 1972). The New Building Notices available at http://www.MetroHistory.com (Office for Metropolitan History) indicate that 17-19 E. 11th was built first (1901), a 7-story brick flat on lot 47 by 93.3 feet. 13-15 E. 11th came a year later (1902), a 9-story brick and stone hotel on lot 47 by 93.6 feet. The first directory listing for the Van Rensselaer Apartment Hotel occurred in the New York telephone directory in 1902. That same year the New York Times reported, "C. H. Wertheim has bought from W. E. Finn, 13 and 15 East Eleventh Street, a plot 47 by 103.3, upon which a nine-story apartment house will be erected." Also in 1902 The Construction News reported, "New York, N.Y. - Louis Korn, 31 West Thirty-third street, has prepared plans for a 9-story hotel, 47x93, to be erected at 13 and 15 East Eleventh street, by Leopold Wertheim, 17 East Eleventh street, at a cost of $165,000." This 9-story building at 13-15 E. 11th St. was known initially as the Alabama Hotel. The inscription The Alabama survives as of 2015 over the entrance to the building. The smaller Van Rensselaer at 17-19 E. 11th St. has a more modest inscription over the entrance - i. e., a simple V R.
In 1909 an ad in the New York Times advertised apartments to let - "furnished: Alabama & Van Rensselaer Hotels $1 daily, including meals, 12.50 weekly; 15 East 11th St., near 5th Av." Then in 1912: "The Duncan Hotel Company has secured a ten-year lease of the Alabama and Van Rensselaer, seven and nine story apartment hotels, occupying a plot 94 by 103.3 at 13 to 19 East Eleventh Street, the rental for the period aggregating about $400,000. The property is owned by the Prudential Traders Company and is to be merged into one holding, to be called the Van Rensselaer by the new company, which is composed of Harlan P. Duncan, Wells D. Morris and Edward McElhinny." From this point the Alabama Hotel name was no longer used. At some point the Duncan Hotel Company became synonymous with David H. Knott and his chain of hotels. This ad from 1912 announced the change in management. The New York Hotel Record, 3 February 1914, listed the following for Knott: "the Hotel Earle, Hotel Holley, Hotel Judson, Hotel Van Rensselaer, Hotel Bristol and Hotel Arlington, New York City." More on the Knott enterprises can be found at Walter's Arlington Hotel page on 14to42.net. In 1925 the following appeared in the NY Herald Tribune, "The David H. Knott interests, which have been operating the Hotel Van Rensselaer and annex at 13 to 19 East Eleventh Street, under lease, have purchased the fee from the Prudential Traders Company. The Van Rensselaer, a seven-story structure, 47x103, at 17 to 19, was built about twenty years ago. The annex, formerly known as the Alabama, covers a plot 47x104, adjoining 13 and 15. The Knotts will hold the properties under the name of the Duncan Hotel Company." Foreclosure came in 1939: "The seven and nine-story Hotel Van Rensselaer at 13-19 East Eleventh Street, was bid in for $101,500 at auction yesterday by the Seamen's Bank for Savings, plaintiff in foreclosure proceedings against the Duncan Hotel Company, et al. The property, which includes a plot 94.2 by 103.3 feet, was sold in satisfaction of a judgment of $220,063 in the Vesey Street rooms by Ralph Long, auctioneer" (New York Times 24 June 1939, pg. 30). In 1951 real estate transfers mentioned that the Van Rensselaer "consists of a seven-story unit and a nine-story one. It was remodeled recently at a cost of more than $80,000 and contains more than 200 rooms." Other reports around this time traced several more lessee changes: "The nine-story, recently modernized 200-room Hotel Van Rensselaer at 13-19 E. 11th St. on a plot 94x103.3 feet, has been leased by Rensselaer Estates, Inc., to Hotel Van Rensselaer, Inc., subject to a mortgage of $250,000, it was announced yesterday by the Lawyers Mortgage and Title Co., which insured the title. The hotel is to be refurnished by the new lessee" (New York Herald Tribune, 15 Jan. 1953, pg. 27) and "The 200-room Van Rensselaer Hotel at 13 to 19 East Eleventh Street, a landmark of the lower Fifth Avenue section, has been sold by Rensselaer Estates, Inc., Samuel D. Bierman, president, to Hotel Van Rensselaer, Inc., a former lessee of the property. The hotel is 100 by 100 feet and was sold for cash over mortgages amounting to $275,000. Title Guarantee and Trust Company insured title to the hotel, which contains a restaurant and cocktail lounge" (New York Times, 26 Jan. 1955, pg. 41). The demise of the Van Rensselaer Hotel came in 1972/73 when it was converted to apartments. As reported in the New York Times, 15 July 1973, section 8, pg. 1, "[the Elghanayan brothers through Rockrose Associates, 31 West 16th Street] have been doing renovations since they started Rockrose four years ago. 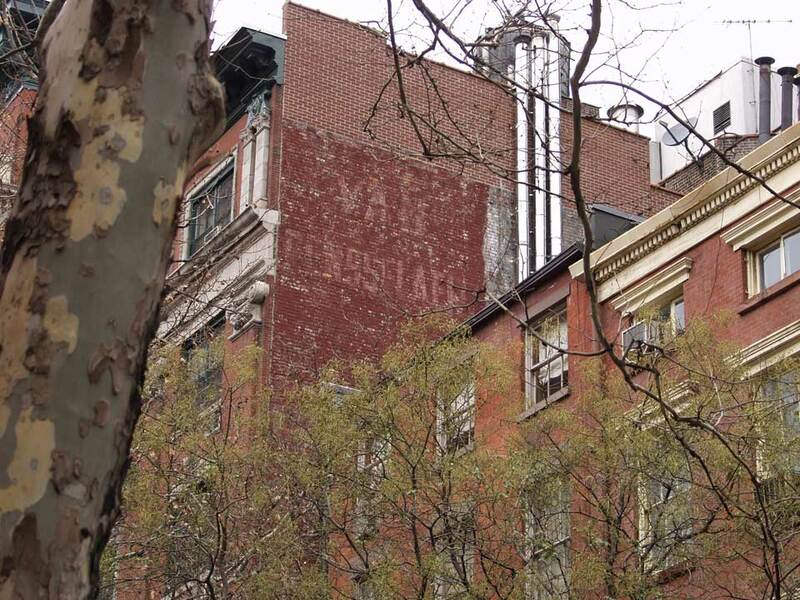 Most of jobs have been small brownstones, but historical buildings are nothing new to them. In fact, they have renovated two landmarks: an apartment building in Brooklyn Heights and the Van Rensselaer Hotel, also on 11th Street, which is now apartments."